ACTIVITY 58: Quickly read the article below by Philip Shehadi (Reuters). Choose the most appropriate title from the menu and then, check the correct answer. Don't worry if there are some words you don't know: you should be able to get the general idea without needing to use your dictionary. Legend has it that, many centuries ago, Touareg tribesmen of the central Sahara put on the veil to trick their enemies into thinking they were women. The trick worked, the enemy was defeated and ever since then the Touareg, a Berber tribe of North Africa, have clung to a tradition which sets them apart from other Moslems: the men are veiled and the women are not. Gone are the days of tribal raids, great camel caravans and endless treks in search of desert pasture. But men in the oasis of Djanet, near the Libyan and Niger borders, still wrap their faces in a long knotted turban which at times leaves only a slit for the eyes. The Touareg turban, or shesh, has come to symbolise the identity of a proud warrior tribe of nomads which has preserved its language and customs under Turkish, French and Arab rule. About 700,000 Touareg live in the Saharan and Sahel regions of Algeria, Libya, Niger and Mali, although fewer than half maintain the nomadic or semi-nomadic pastoral life of their forefathers. The turban is increasingly discarded by the young, who pick up Arab or Western ways at school and through television, beamed to Djanet by satellite from Algiers 2,000 kilometres to the north-west. But few men over 30 fail to cover their face when they leave home for the fields, the office or a simple village errand. Even the young cover up on special occasions and say that beneath their jeans and Western-style haircuts they remain true to Touareg roots. 'There are old men whose women have never seen their mouths in 30 years of marriage,' said Hamou Dahou, director of the Tim Betir travel agency. The Touareg veil has fascinated visitors ever since the Arab traveller and observer Ibn Khaldoun toured North Africa in the 14th century and found most Berber desert tribesmen wrapped up tightly in a ball of cloth. The turban humidifies the mouth and nose in the dry-desert air and protects them like a filter when wind whips up clouds of choking sand. But the custom is so closely linked to honour that one French ethnologist spoke of a 'taboo of the mouth'. 'Showing your mouth was considered a sign of greed,' said Sheikh Amoud, 78, son of a Touareg resistance hero of the same name who fought the French in the Algerian Sahara and later the Italians in Libya's Fezzan province. 'In the old days, the first time a boy put on the turban there was a big ceremony because it meant he had become a man,' said Hadj Suleiman, 60, a member of Djanet's town council. ACTIVITY 59: Now, read the article again carefully. For questions 1-5, choose the answer (A, B, C or D) which you think fits best according to the article. Before looking up a word you don't understand in your dictionary, decide if you really need to know what it means. Then check your answers. According to legend, why did Touareg men first put on the veil? What does the article say about young men and the turban? A. They prefer it to Arab and Western clothes. B. They wear it to go out in public. C. They wear it for important events. D. They use it to hide trendy haircuts. What does 'them' (paragraph 11) refer to? 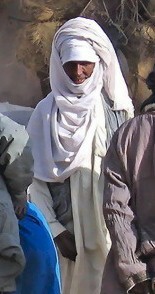 B. most Berber desert tribesmen. C. the mouth and nose. D. clouds of choking sand. A. the art of living in the desert. B. Touareg resistance to foreign rule. C. how the Touareg control their feelings. D. what it means to be a male Touareg. ACTIVITY 60: Finally, find the words in the article which express the explanations below. Then check your answers. Entretenidos tanto el artículo como la actividad ! !